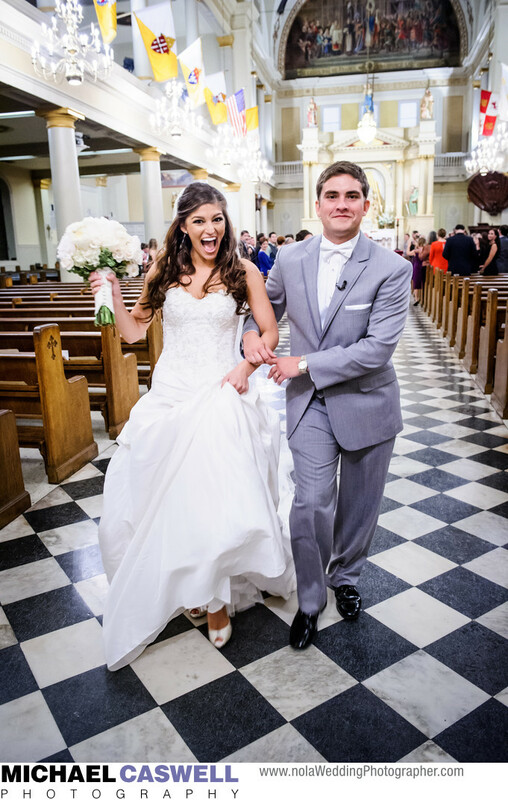 In this delightful photograph, the gorgeous and happy bride flashes a huge smile as her an her new husband make their way down the asile at Saint Louis Cathedral at the conclusion of their wedding ceremony. This historic and famous Cathedral, located adjacent to Jackson Square, is a New Orleans icon, and is instantly recognizable. There are numerous amazing reception venues located nearby, like the Riverview Room, the Jaxson, Pat O's on the River, and Latrobes, as well as several opulent hotel ballrooms, and often a second line parade is the preferred mode of transportation to get everyone to the reception. Such was the case with this wedding as the couple and their guests then joined up with the brass band waiting outside to lead them through the cheering groups of onlookers along the streets of the French Quarter as they all made their way to the Omni Royal Orleans' beautiful ballroom for the reception. There's no better way to begin a wedding celebration in New Orleans! Location: 615 Pere Antoine Alley, New Orleans, LA 70116.